Whenever I visit Washington, I try to eat my weight in seafood and shellfish, because the quality is just so good. Have I mentioned how much I love clams? In fact, I like any kind of shellfish, with oysters being the exception. It's rare to find clams in the UK (they're called "cockles" here) and when you're do, they're tiny, chewy, and vaguely tasteless. On Tuesday of our visit, my dad's boss dug fresh saltwater clams from his beachfront home in Shelton for us to enjoy. In comparison to UK cockles, the clams supplied by my dad's boss were large, succulent, sweet, and tasted of the sea - we washed them down with glasses of crisp Pinot Grigio and filled four large bowls with our discarded shells. 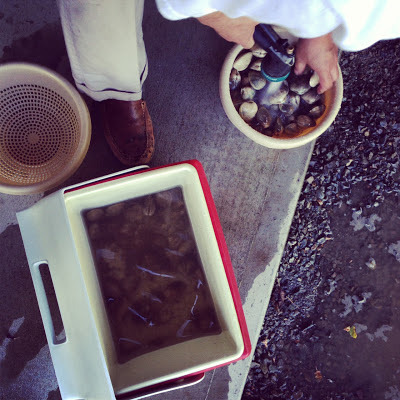 In this photo, my dad is preparing the clams by rinsing them three or four times in the garden. Then, my mom steamed them with some chicken broth, onions, garlic, and white wine. Bellisimo. It's safe to say that we were all happy as clams that night, with the deck door open and the sun setting over the Pacific Northwest.